For general dissemination, and to be posted at AmRRON.com and elsewhere. the date, time, place, guidelines and format for the hotwash. 9/16 Multiple Tornato Warnings (VA, SC, NC..[more]…) Once you are on the link, scroll down and click “Download N3FJP’s WX Warning Program 1.8 Now (New, Full Installation)”. Once the software is installed, you will receive real-time warnings. 9/11 This image was downloaded directly from the satellite by an AmRRON Corps operator. 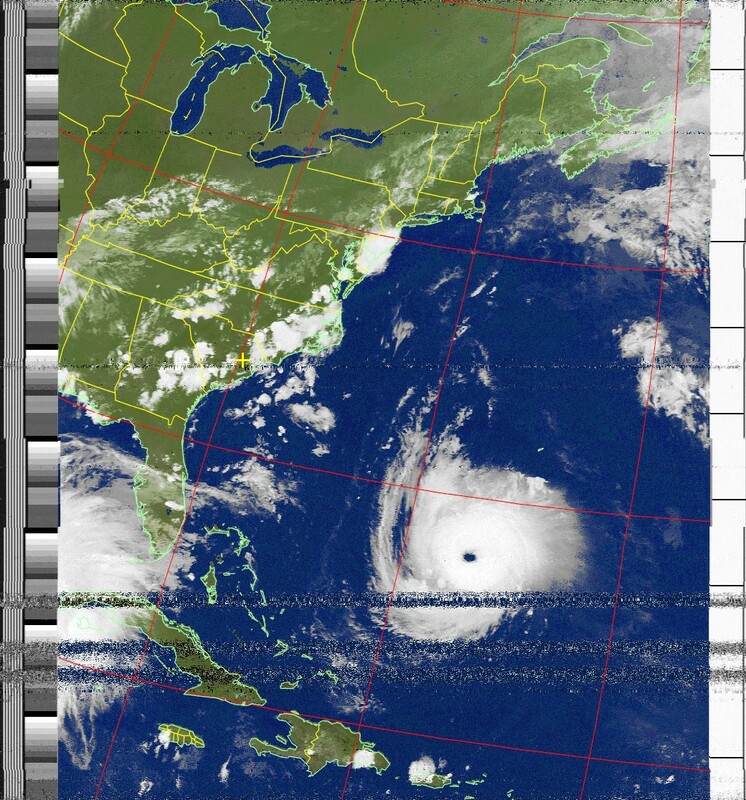 NOAA 19 satellite at 2036Z today. There is the potential for Florence to stall or significantly reduce its forward speed as it nears the coast, which could prolong the effects of damaging winds, storm surge flooding and beach erosion. A stall or slow forward speed would also greatly enhance inland flooding of streams and rivers. “There’s never been a storm like Florence. It was located farther north in the Atlantic than any other storm to ever hit the Carolinas, so what we’re forecasting is unprecedented. Ferries bringing evacuees from Ocracoke Island to Swan Quarter on the mainland are expected to run as long as possible ahead of Hurricane Florence. Each trip from the island across the Pamlico Sound to the mainland takes nearly three hours. An estimated 1 million South Carolina residents are expected to flee from coastal areas as Hurricane Florence approaches, Gov. Henry McMaster said Monday. McMaster has ordered mandatory evacuations at noon Tuesday in parts of almost every city and town in eight coastal counties. Traffic on all lanes of four major roads, including Interstate 26 between Charleston and Columbia, will be directed away from the coast through a process known as lane-reversal. "This is very dangerous hurricane," McMaster said during a news conference Monday afternoon. HATTERAS ISLAND, N.C. (WAVY) -- Mandatory evacuations are expected to being Monday for residents and visitors in the Outer Banks. Dare County officials said Monday a state of emergency was issued, along with the evacuation order. Evacuations for Hatteras Island -- including the villages of Rodanthe, Waves, Salvo, Avon, Buxton, Frisco and Hatteras Village -- will begin at 12 p.m. on Monday.